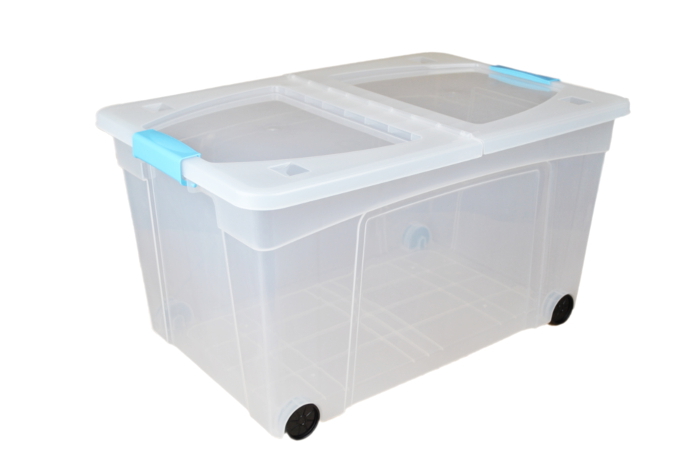 60 litre wheeled storage boxes with clip lid. Can be purchased in a range of discounted packs or as a single box. A premium, strong and durable clear plastic storage box with a spilt folding lid. 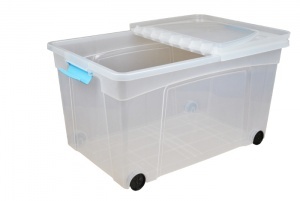 This 60 litre box is suitable for storing a wide range of items in both the home and at work. Manufactured from polypropylene plastic, the clever design allows for both stacking and nesting of the boxes. The folding-split lid allows easy access to the contents without the need to remove the lid entirely. Indents in the top of the lid allow another box to be stacked safely on top without the risk of slipping off. The light blue clip handles fix the lid securely in place ensuring they cannot unfasten during lifting. The box is also supplied with four ready-fitted wheels to aid manoeuvrability and these sit in strong, reinforced holders, in a strengthened base, greatly reducing the risk of breakage.